Troops deployed around the world, including in war zones, took a moment’s respite from their efforts to keep America safe to film Thanksgiving greetings for family and friends back home in videos posted by the Pentagon. “I just want to say Happy Thanksgiving to my wife, my two little boys, and also say happy birthday to my little boy turning three, and a shoutout to my mom and my sister, and love what we’re doing,” said Army Sgt. Joe Brewster with the 87th Sapper Company deployed to Arizona to support the border mission. Navy Cmdr. Chawn Brown, from Suffolk, Virginia, wished his family Happy Thanksgiving from aboard the U.S. Navy hospital ship USNS Comfort, which is on an 11-week medical support mission to help Central and South Americans. “I would like to wish a Happy Thanksgiving to my beautiful wife Dana, my beautiful daughters Payton and Addison, and I am thankful to the patients who allowed us to care of them in South and Central America,” he said. “I’ll like to say hi to my friends in family, they shall see us soon,” said an unnamed U.S. service member stationed in Niger, where a terrorist ambush killed four American troops in October 2017. “I’d like to wish all my family and friends and my boyfriend a happy holiday,” added another unnamed U.S. service member stationed in Southwest Asia, which covers the Afghanistan war that has been raging for more than 17 years. Some airmen deployed to Incirlik, a Turkey, were surprised with taped messages from their families. They were told they were going to do “holiday shoutouts” to their families, and when they sat down to record, they have presented messages from their families. Some were moved to tears. Troops also gave shoutouts to their families from Djibouti, Iraq, Kuwait, Peru, Poland, and South Korea. Some leaders visited troops overseas. Chief of Naval Operations Adm. John Richardson and the Master Chief Petty Officer of the Navy Russell Smith visited sailors in Naples on Tuesday. 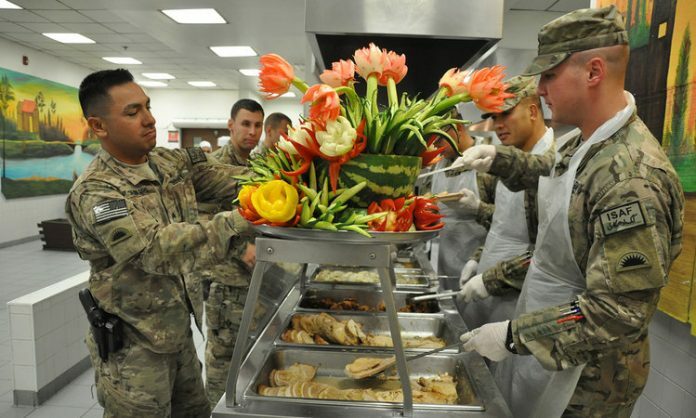 And most importantly, many troops overseas had the opportunity to have a traditional Thanksgiving meal. More than 300 Butterball turkeys made their way out to Doha, Qatar, this week, for U.S. troops serving in the Middle East.